The revolutionary approach of a Dutch abbey in areas such as existential questions, LGBT+ matters and communal life. "Contemplation is something everyone seeks". The Reverend Denis Hendrickx, 71st abbot of the Berne Abbey | © Jassir de Windt. In a competitive world where bustle and burn-outs seem to be commonplace, a new development is arising in the Netherlands: an increasingly large group of people is looking for peace and quiet in the nation’s few monasteries and abbeys. How does this work in practice and how does it add up to the recent developments in the Catholic Church? 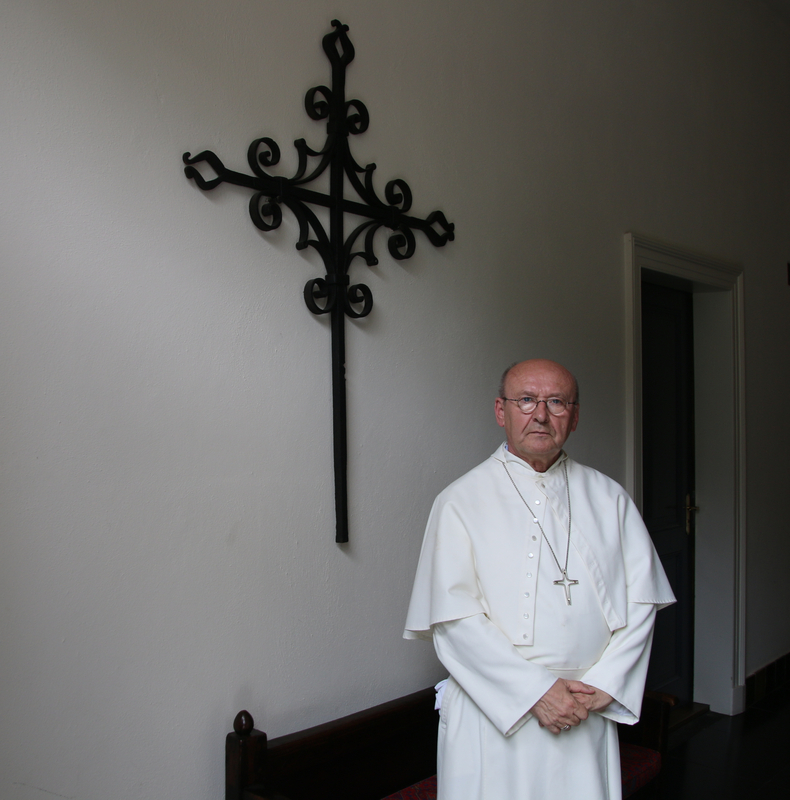 The following is an interview with Denis Hendrickx, 71st abbot of the Berne Abbey located in the Dutch province of North Brabant. Founded in 1134 in the settlement of Berne aan de Maas, this Norbertine monastic community is the oldest extant in the Netherlands, having lived through the Protestant Reformation. “By and large, there is a central thread that cuts across all our visits”, says the Reverend Hendrickx. “By this, I mean that contemplation is something everyone seeks”. He specifies that the abbey’s visitor groups can essentially be subdivided into two categories: individual guests who are longing to catch their breath and larger organised groups that purposefully pick the abbey, be it for team building purposes or nostalgic and inquisitive reasons. “50% of our visitors are Protestant, the reason being that, at the hands of the Reformation, Protestantism in the Netherlands saw the sudden end of monasticism”, Hendrickx explains. “As such, these are people that are often drawn to a certain degree of mysticism that is no longer found within their own religion”. Recently, the internationally renowned Dutch scholar and theologian, professor Paul van Geest, argued that Dutch monasteries are accommodating to current times while also adapting to the needs of peoples and societies — a line of thought that is endorsed by Hendrickx. “Contrary to other orders we, the Premonstratensians, also known as Norbertines or, in the United Kingdom, White Canons, adhere to a vita mixta — that is a balance between contemplation and activities that are affiliated with the needs in society”. Against this background, in 2016, the Berne Abbey became one of the few Dutch monastic communities to have opened its doors to refugees. “At a given moment, the Netherlands was exposed to a large influx of forcibly displaced people. On moments like those, one should not only talk the talk but also walk the walk”, Hendrickx says. In this light, the Reverend Father does also introduce a nuance to the debate in that clergymen should fully distance themselves from politics. “While visiting our congregation in Wisconsin, USA, a while ago, I was struck by the notion that many families in that nation are torn between politics and the affection for one another. Equivalently, a monastic life does not make any man an island as all things are connected”. Similarly, in 2017 the Berne Abbey received cross-border attention given an open letter addressed to Gerard de Korte, bishop of the diocese of ‘s-Hertogenbosch. In the letter, Hendrickx openly regretted the bishop’s decision to have succumbed to public pressure by withdrawing his earlier consent for an ecumenical prayer service in the Cathedral Church of St. John on Pink Saturday, a Dutch annual LGBT+ theme day. Says Hendrickx: “In the spirit of the philosophy of Pope Francis, who am I to judge gay people? Besides, in this day and age, being part of the constellation of the Catholic Church requires the ability to stick one’s neck out. Unlike gender or gender expression, it is the quality and exclusiveness of the relationship between individuals that should be at the centre”. first set off into the wide world for at least five years”. In the wake of changes and shifts, Hendrickx foresees major amendments in the Roman Catholic Church in the years to come, even if it is only to warrant the church’s common purpose. “Although there will always be an ecclesial community, parishes are likely to dissolve in the next few decades. I believe that people are, ever more, looking for possibilities to be meaningfully involved with several activities while being part of a wider community”. In the particular case of the Berne Abbey, Hendrickx is of the opinion that the possibility of a beguinage, that is an architectural complex that allows individuals to live in the community of the abbey, shall be further examined. “This design would give one the chance to have a private residence without the obligation to take vows or retire from the world — instead, an agreement for a definite period is made in which participants are involved in the most important aspects of communal life, including prayers, meals and specific activities. I am somewhat referring to a spiritual and meeting centre in which people are allowed to live and work together in a contemporary setting”. In all this, the Reverend Father believes that there is most certainly room for a young generation — provided that one piece of advice is borne in mind. “I would recommend any young person that would like to embrace a more traditional monastic life, to first set off into the wide world for at least five years. Once you have grown more mature on a physical, spiritual and emotional level, you will be able to make a more well-considered choice that will indeed suit you and your social setting”. Born in Europe (The Netherlands) and raised in the Caribbean (Curaçao), Jassir de Windt is a supporter of constructive journalism and alter-globalisation. His fields of interest are in the area of international relations, human rights, cultural pluriformity, development and social change. Based in Amsterdam, he holds a master's degree in Communication for Development from Malmö University (Sweden).